Get Out Your Paint Brushes! 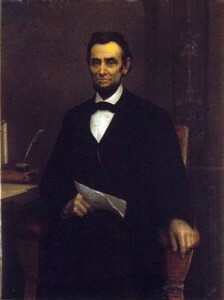 There will be an art contest to reproduce a Lincoln Portrait painted in 1890 by John Denison Crocker. The painting hung for many years in City Hall at Norwich,Ct. that is until 1994 when it was cut from its frame and stolen. The image has not surfaced in the 16 years since the heist. Funding from The Slater Memorial Museum, www.norwichfreeacademy.com/museum/ Norwich Historical Society, http://www.norwichhistoricalsociety.org/ and the Sachem Fund http://www.norwichct.org/ will purchase the winning entry in the Lincoln Portrait contest for $8000.00. The winning artist will relinquish the rights to the portrait, which will then go on display in the original frame back on the walls of City Hall. Painters are you ready? There is a whole winter ahead to perfect the war worn features of one of our most famous and influential Presidents. All submissions will be gathered by April 15, 2011 at 3 p.m. ( just a little before the infamous tax deadline) The entries will all be displayed at Norwich Arts Council Gallery 60 Broad St. Norwich, Ct. from May 1 – May 29, 2011. http://www.norwicharts.org/ A judges panel will discern the winner. More info can be acquired by calling 860-425-5560.